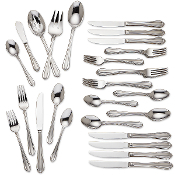 Gorham 65 Piece Biscayne Flatware Set Description 18/10 Stainless Steel. Dishwasher Safe and Tarnish Resistant. Includes 1 each place fork, place knife, salad fork, place spoon, and teaspoon. 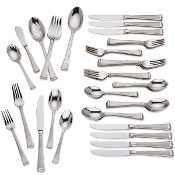 This 45 Piece Set of Frosted Flatware includes 8 of each: Forks, Dinner Knives, Salad Forks, Dinner Spoons, Teaspoons. The set also includes a Tablespoon, Pierced Tablespoon, Butter Knife, Sugar Spoon, and Cold Meat Fork. 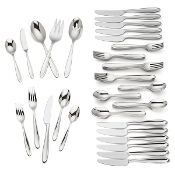 This 45 Piece Set of Melon Bud Frosted Flatware includes 8 of each: Forks, Dinner Knives, Salad Forks, Dinner Spoons, Teaspoons. The set also includes a Tablespoon, Pierced Tablespoon, Butter Knife, Sugar Spoon, and Cold Meat Fork. Make Cantera silverware your strategy for a simply gorgeous table setting wth the Lenox Guarantee. 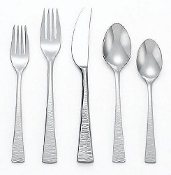 Included: 12 dinner fork, dinner knives, salad forks, dinner spoons, teaspoons, and a Tablespoon, Pierced tablespoon, Butter knife, Sugar spoon, and Cold meat fork.